Chandigarh, November 10 Thursday, 2016 :- Minutes after the Supreme Court announced its verdict on the controversial and long-pending SYL issue, Punjab Congress president Captain Amarinder Singh on Thursday resigned his Lok Sabha seat, even as all party MLAs quit their Assembly seats, in protest against the injustice meted out to the people of the state. 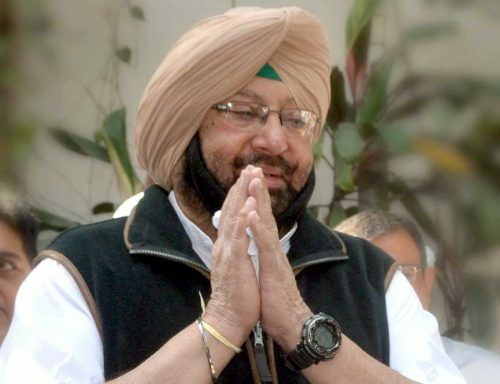 Captain Amarinder has sent his resignation to the Lok Sabha Speaker and has also sought a personal meeting next week. The party MLAs have also sent their resignations to the Speaker, Punjab Assembly, and will meet him tomorrow morning to personally hand over their papers. Describing the SYL judgement by the apex court as a “major blow to the people of Punjab,” Captain Amarinder said he had always fought for their legitimate right on this issue and continues to stand by them at this critical juncture in the state’s journey. Blaming the Akalis squarely for bringing the people of Punjab to this pitiable situation, where they faced imminent devastation due to acute water scarcity, Captain Amarinder said Badal and his team had failed to defend Punjab’s stand in the court, leading to such disastrous consequences for the state. “The Akalis let down the people of Punjab on this critical issue, selling off their interests to Haryana,” said Captain Amarinder said, accusing the Badal government of promoting its vested political interests at the cost of the interests of the state. “Badal has done to Punjab what even its worst enemy could not have done. He has plunged Punjab into a state of total despair,” said Captain Amarinder, declaring that the people of the state will not forgive the Akalis for playing with their lives. The Akali government, said the Punjab Pradesh Congress Committee (PPCC) president, had gone all out to scuttle every move of the Congress to bring relief to the people of Punjab in the SYL matter. Recalling that his government had tried to protect Punjab’s interests through the Punjab Termination of Agreements Bill, 2004, Captain Amarinder said the Akalis, on the other hand, had exposed them to unprecedented hardship as a result of their failure to safeguard their interests in the court. The Badals never had the interests of the people of Punjab at heart, as is evident from the way they have handled the issue all these years. The theatrics they are now indulging in, by demanding royalty for water-sharing and asserting that they would not allow a single drop of water to leave Punjab, are not going to save Punjab’s citizens, said Captain Amarinder. On the contrary, the preposterous idea floated by Chief Minister Parkash Singh Badal to seek royalty from other states using Sutlej water would be even more detrimental to the interests of Punjab, since it was itself using water receiving from neighbouring Himachal Pradesh. “After helping out Haryana, it seems Badal is now trying to help Himachal Pradesh, by suggesting that it should demand royalty from Punjab,” said Captain Amarinder. Accusing the Akali leader of shamelessly showing dual standards in the matter, the PPCC said it was, in fact, the Akali government in Punjab which had been responsible for putting the state on the back foot on the SYL issue. He cited documentary evidence to hold Badal responsible for `selling off the interests of Punjab.” Badal had been instrumental in acquiring land for SYL construction in Punjab through a notification dated February 20, 1978, and taking money from Haryana, thus weakening Punjab’s position in the prolonged dispute, said Captain Amarinder, accusing him of playing dirty politics over the issue. Captain Amarinder revealed that Badal issued the notification for land acquisition for the SYL on February 20, 1978 vide notification nos: 113/5/SYL and 121/5/SYL under section 4 of the Land Acquisition Act. With this, the process of land acquisition started, Capt Amarinder pointed out. Subsequently, he added, Badal wrote to Haryana government vide letters no: 7/78-IW(i)-78/23617 demanding payment of Rs 3 crore more as he had already taken Rs 2 crore for the purpose. This was in follow up to an agreement between him and Devi Lal, the then Chief Minister of Haryana that Haryana will pay Rs 5 crores to Punjab. The PPCC president disclosed that this was acknowledged by Devi Lal in the Haryana Vidhan Sabha on March 1, 1978 (record attached), where he proudly claimed that it was because of his personal relationship with Badal that he had convinced him (Badal) for land acquisition for the SYL. “For personal relationship with Devi Lal, Badal put Punjab’s interests at stake,” said Captain Amarinder. The Punjab Congress president said not only did Badal acquire land to please his friend, Devi Lal, he had also decided to hold a function where he would lay the foundation stone and Devi Lal would preside over that function. He said, the matter got delayed and fresh elections were called for after both the Badal and Devi Lal governments fell. Captain Amarinder quoted Devi Lal’s speech (in Hindi) delivered in the Haryana Vidhan Sabha on March 1, 1978, where he (Devi Lal) said, “hamare aappas ke taluqaat (mutual relationship with Badal) ka sabb se pehla nateeja yeh nikla hai aur woh aapke saamne hai ki hamari sarkar Badal sarkar ke sath baat-cheet karr ke iss nateejey parr pahunchi hai ki unhoone notification (for land acquisition) jaari karr diya hai”. He said Devi Lal made these remarks after opposition members in the Haryana Vidhan Sabha had referred to his personal relationship with Badal. In the same speech, Captain Amarinder president further quoted Devi Lal as saying, “mein ek baat yeh be batta du ki session (Vidhan Sabha session) ki wajjah se rukaawat padd ghai, varna mujey uss function (for laying the foundation stone of the SYL in Punjab) ko preside karna tha aur Badal Sahab ne uska udd-ghaattan karna tha”. sanctity of the Punjab Termination of Agreements Act, 2004, which his government had passed to annul all inter-state water sharing agreements signed by Punjab. In fact, said Captain Amarinder, the NDA, of which Badal’s Shiromani Akali Dal is a part, took an anti-Punjab stand during the hearing on the Presidential Reference pertaining to the Punjab Termination of Agreements Act, 2004, laying bare the hypocrisy of the Badals in this whole affair.